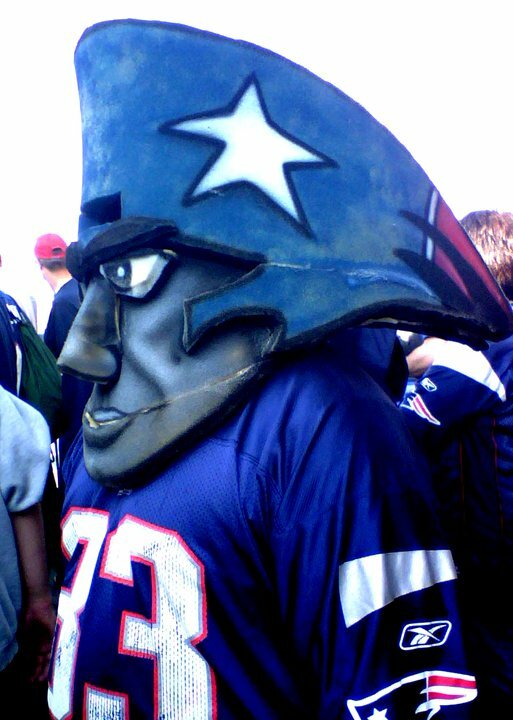 "There's a long drive, if it stays fair..." - Cursed To First - Sox and Pats forever. "There's a long drive, if it stays fair..."
When this home run happened thirty years ago, I was still five years away from existence. 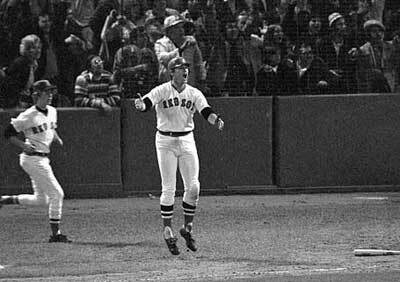 There's little to no reason for me to be personally attached to Carlton Fisk. I never saw him play, never owned his baseball card, never endured the heartbreak that was his move to Chicago through free agency, never personally witnessed the wrenching emotion of his first home run as a White Sox at Fenway Park, when the whole place got on its feet anyway, and cheered. 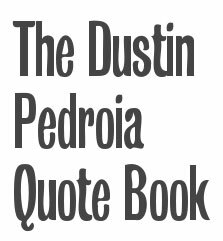 He doesn't have the poignance of Tony C., doesn't have the stinging betrayal of Wade Boggs, doesn't have the friendliness of Dewey Evans or the tenure of Yaz; the cachet of Ted Williams, the fire of Dennis Eckersley, or the panache of David Ortiz. As a citizen of the Nation, it's satisfactory for someone my age just to know and respect his place in history, and move on. And yet I'm drawn to Fisk. I love to watch his interviews--his rumbling gravelly cigarette voice and his thick, weathered skin and his deadpan expression. I love to see photos of him when he was still playing. I love to think about how he's from New Hampshire and how that's the first thing everyone thought of when he hit that legendary home run on this day in October in a Series the Sox "won", three games to four. I have taken to calling him, audaciously, "Pudge", though I've not earned any right to use that endearment. The one time he and I attended the same game at Fenway Park, and he was announced in the Legends box, I stood up and raised my hands toward the tiny figure in the blue Oxford shirt above and to my right, as if he'd look down and recognize me applauding. 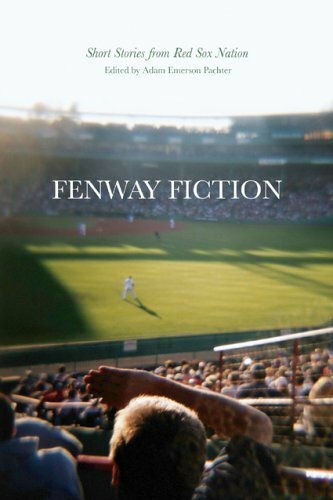 I made him a very prominent character in the short story I wrote for Fenway Fiction; in fact, I made my main character a decade older than I am so that she could have had Pudge as a favorite player growing up. 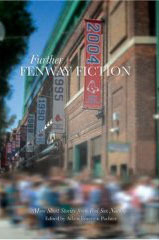 In my bio blurb at the back of the book, my "fun" fact is: "She will always regret not having seen Carlton Fisk in action." I meant it. I told this to my father once, and he said, incredulously, "But you've been around at the best time! When they won! You saw it happen!" I don't want to trade one for the other, of course. And of course I wouldn't really accept the innumerable ways it would alter the fabric of my existence if I'd been born when Richard Nixon was President instead of Ronald Reagan. But sometimes I think about the places I'd go if I had a time machine, and this night, October 21, 1975, would certainly be one of them. I would, of course, have some of the surprise ruined for me--I imagine I'd be wiggling in my seat from the seventh inning on. I might be appalled at the differences between the Fenway crowd then and now. I'd stick out like a sore thumb for many reasons; I might even need a place to hide if I wanted to watch the game in peace. I'd have to resist the extreme temptation to bring along my own camera. But I'd do it anyway. I'd go, and find a way into the park (in fact, I've imagined doing this so many times I actually feel cheated when I realize that I really can't). I'd sit there and watch that home run hit the pole, christen it Fisk's, watch him do the dance I have memorized by now--"Get over! Get OVER!" I'd watch him plow his way through the onrushing crowd to round the bases. I'd stand and cheer, clapping with my hands in the air like I did when he waved from the Legends box, as if he'd recognize me applauding. I may not know why I feel this overwhelming connection, but I can't deny that I do. that is FANTASTIC, rana. i hope he posts that letter ASAP! Gotta run. Thanks for helping to job my memory!